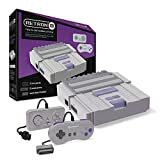 The Hyperkin RetroN 2 Gaming Console might look just like Nintendo’s own Super NES Classic Edition retro video game console, but it’s actually so much better. While the SNES Classic is going to just collect dust on a shelf once you grow tired of the handful of preinstalled games, the RetroN 2 lets you play any physical SNES game cartridge that has ever been released. What’s more, it also supports every original NES game cart! For $45 on Amazon, it really can’t be beat.